Sunlight is a general term for the electromagnetic radiation emitted by the sun (also known as Solar radiation). It provides both light and heat for the many creatures that inhabit the Earth, but also serves as the source of energy that plants use to perform photosynthesis. In addition, sunlight is an abundant natural resource that humans can capture and convert into other useful forms of energy, such as electricity, using a variety of technologies. The Earth revolves around the sun in an elliptical orbit and is closer to the sun during part of the year. When the sun is nearer the Earth, the Earth's surface receives a little more sunlight. The Earth is nearer the sun when it's summer in the southern hemisphere and winter in the northern hemisphere. However the presence of vast oceans moderates the hotter summers and colder winters one would expect to see in the southern hemisphere as a result of this difference. Countries like the United States, which lie in the middle latitudes, receive more sunlight in the summer not only because days are longer, but also because the sun is nearly overhead. The sun's rays are far more slanted during the shorter days of the winter months. Cities like Denver, Colorado, (near 40º latitude) receive nearly three times more sunlight in June than they do in December. The rotation of the Earth is responsible for hourly variations in sunlight. In the early morning and late afternoon, the sun is low in the sky. Its rays travel further through the atmosphere than at noon when the sun is at its highest point. On a clear day, the greatest amount of sunlight reaches the surface around solar noon. This is called diffuse solar radiation. The sunlight that reaches the Earth's surface without being diffused is called direct beam solar radiation. 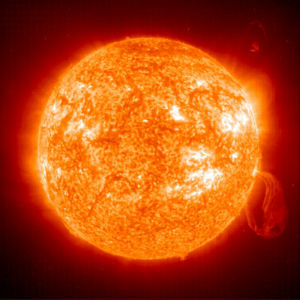 The sum of the diffuse and direct radiation is called global solar radiation. Atmospheric conditions can reduce direct beam radiation by 10% on clear, dry days and by 100% during thick, cloudy days. ↑ 1.0 1.1 1.2 1.3 1.4 1.5 1.6 1.7 Solar Radiation Basics U.S. Department of Energy. Accessed July 25, 2010. This page was last modified on 25 July 2010, at 16:21.